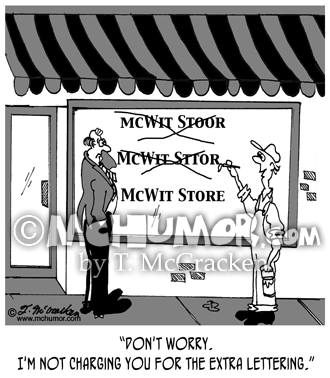 Business Cartoon 5051: Someone painting a name on a store has crossed out several mistakes. 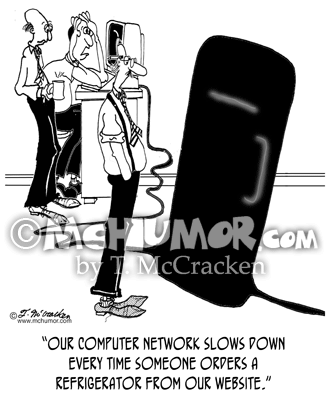 He says, “Don't worry. 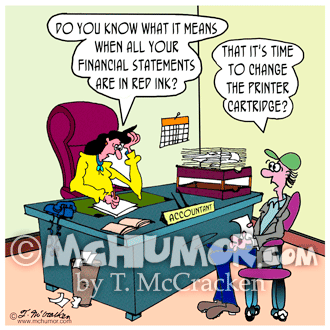 I'm not charging you for the extra lettering." 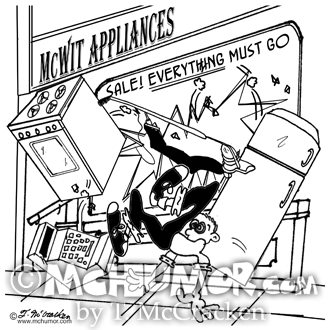 Business Cartoon 7730: At McWit Appliance Store there’s a sign, "Sale. 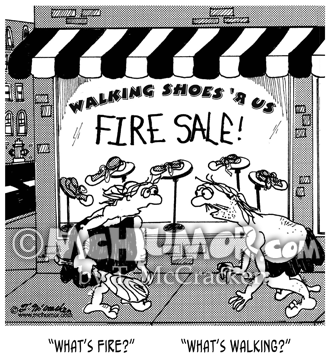 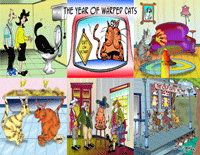 Everything Must Go." Refrigerators, stoves, vacuums, a cash register and an employee are being thrown out the window. 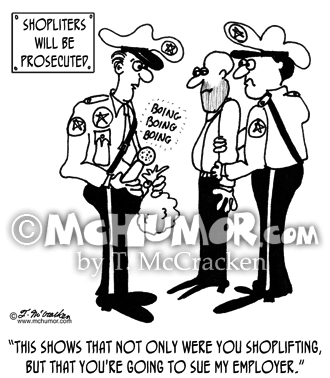 Lawsuit Cartoon 3823: A security guard with a beeping wand says, "This shows that not only were you shoplifting, but that you're going to sue my employer." 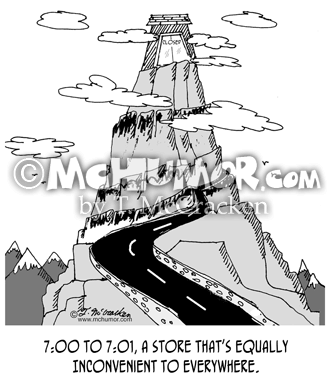 Store Cartoon 5735: A remote store at the top of a cliff advertises, "7:00 to 7:01, a Store That's Equally Inconvenient to Everywhere." 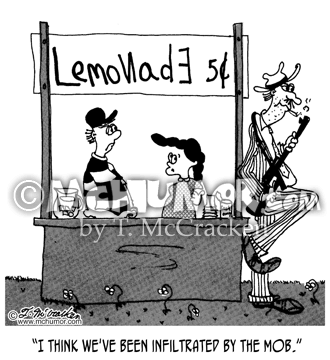 Kid Cartoon 5189: A kid at a lemonade stand, looking at a thug with a machine gun saying, "I think we've been infiltrated by the mob." 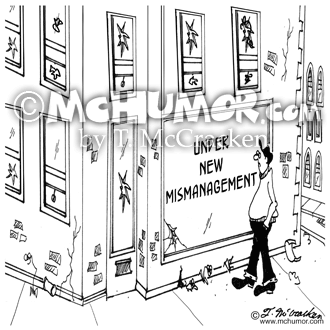 Management Cartoon 5695: A dumpy store has a sign, "Under New Mismanagement." 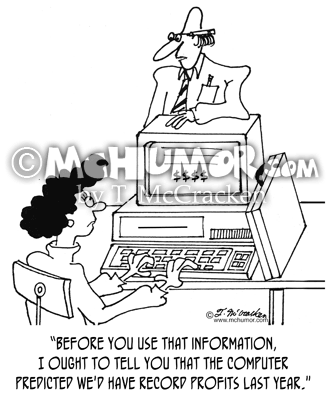 Computer Cartoon 3625: A man says to a woman at a computer, "Before you use that information, I ought to tell you that the computer predicted we'd have record profits last year."